Wadhurst Dramatic Club – Young or Old, Have Fun, Be Bold! Join us at our Annual General Meeting when we discuss ideas for the future – we’d welcome your input. Without a new Commemoration Hall on the horizon, we need to look at how we can improve and enhance the performance, rehearsal and storage space that we have – so anyone with ideas is very welcome to come along. In this past year, we’ve invested in new sound, light and stage equipment, so we have a very real contribution to make. We are a very inclusive drama club, we don’t have members, so all supporters are welcome at all our events. We are looking at restructuring the committee to try and broaden the contribution while reducing the individual workload, so there is plenty of opportunity for involvement without too much commitment. If you’d be prepared to our friendly committee, just click reply to this email. we’d love to hear from you. And of course there’ll be nibbles and drinks to toast the success of ‘Allo ‘Allo, W.O.T.T., Private Peaceful and Bah Humbug! and to welcome in the next dramatic year! Comments Off on A Bunch of Amateurs! We have now have selected a full cast for this hilarious play written by Nick Newman and Ian Hislop (yes, the one from the ‘Have I Got News For You‘ and Private Eye). Comments Off on Bah Humbug! A success! This moving story of a First World War soldier by Michael Morpurgo is translated into a powerful, thought-provoking drama performed by the Wadhurst Youth Theatre group, WYTKidz, directed by Amanda Dann. 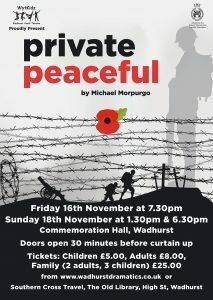 ‘Private Peaceful‘ is the story of a 16 year old, First World War soldier, Tommo Peaceful, who is awaiting the firing squad at dawn. The night before, he relives his joyful childhood at school, his adventures with Molly, the love of his life, and the injustices of the war that brought him to the front line. At the end of November we had a good ol’ catch up and not only reviewed 2017 but looked forward to 2018 and beyond. We celebrated our two Accolades of Excellence awarded by NODA South East Region for WYTKidz’ Grease and WDC’s Way Out West In A Dress. John Bush, our president, presented the NODA certificates to the respective directors, Amanda Dann and Kay Sasada. They will hang on our new picture rail in the Orchard Room. The elected committee are John Bush (President), Jan Lynam (Chair), Marianne Johnson (Treasurer), Catherine Whitehead (Vice Chair), Jill Haskell (Minutes Secretary), Dot Smytherman, Amanda Dann, Anneka Bones, Merlin Beedell, Russ Kirton, James Edwards, Paul Desrosiers and Penny Bones. Comments Off on Hairspray the musical – Read the Review! Hairspray the musical – Read the Review! 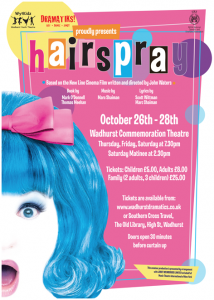 A vibrant and talented young cast will be taking to the Commemoration Hall stage at the end of October to bring you the scintillating and funny 60s musical, ‘Hairspray’. In 1962 Baltimore, Maryland, plump teenager Tracy Turnblad’s dream is to dance on The Corny Collins Show, a local TV dance programme. When Tracy wins a role on the show, she becomes a celebrity overnight, and meets a colourful array of characters, leading to social change as she campaigns for the show’s integration. In 2003 the show won eight Tony Awards, including one for Best Musical, out of 13 nominations. It ran for 2,642 performances, and closed on January 4, 2009. Hairspray was adapted in 2007 as a musical film and also had a London West End production nominated for a record-setting eleven Laurence Olivier Awards, winning four including Best New Musical. Tickets: £8 for adults, £5 for under 18s, £25 family ticket (2 adults & up to 3 children) – available from the beginning of October on TicketSource or from Southern Cross Travel on Wadhurst High St (right next to the Commem). Special rates for groups of 10 or more – please contact Catherine c.m.whitehead@btinternet.com or on 01892 783384. Performances start at 7.30pm on Thursday 26th, Friday 27th and Saturday 28th with a matinee at 2.30pm on Saturday 28th October. Doors and bar open half an hour before curtain up. 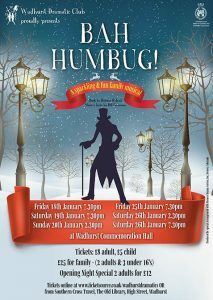 We’ll have you dancing in the aisles, you’ll come away singing and wowed by the young talent we have in Wadhurst! Comments Off on “Can’t Pay? Won’t Pay!” The NODA Review! “Can’t Pay? Won’t Pay!” The NODA Review! The play, by Nobel prize-winning Dario Fo, is a combination of comedy and satire. A spontaneous demonstration by women against rising prices ends in a riot and mass theft. Crazy disasters pile on each other as Antonia and Margherita try to conceal from their husbands what they have stolen by pretending to be miraculously pregnant and try to convince a sceptical police inspector that all the local women are celebrating the feast of St. Eulalia, the patron saint of fertility. This leads to characters eating dog food, making soup from strange ingredients, hiding in coffins and a Maoist police sergeant following Giovanni and Luigi’s lead and looting goods from a jack-knifed lorry. The comedy is fast and furious with an undertone of real pathos and contains some coarse language. See the Full Programme and Review for the production that took place on Thursday 18th, Friday 19th and Saturday 20th May, starting at 7.45pm. Comments Off on Auditions, Films, Reviews! See the recently published Noda Report On WDC 70th Year Celebrations. Very nice summary of events. Don’t forget to come to the Auditions for “Can’t Pay, Won’t Pay” next Monday (23rd Jan). Have you booked your tickets to see WYTKidz Grease (3:30pm) and the fabulous Mamma Mia movie (7:30pm) on Sat 28th? Projected onto the big screen at the Commem! Sing and dance along for only £5 (£3 kids) for both. The hall was nicely laid out in cabaret form.. Click Here to read the full review!